In the offices of Abstergo Entertainment, the modern day setting that frames Assassin’s Creed Rogue’s story, the nameless, faceless character you play can hack computers to access two types of documents. The first, inter-office emails, depict the worn-out employees of a Montreal-based game company spit-balling often terrible ideas and lamenting the struggle of targeting women as a demographic. These memos are Ubisoft’s way of trying to be in on the jokes frequently made at its expense, and they implicitly suggest that Assassin’s Creed is nothing more than a series about wearin’ hoods and stabbin’ folks. The second, a series of sound files, feature a self-important old man babbling on about the nobility of the Templar legacy, dully building back up the incomprehensible series mythology the emails attempt to tear down. Assassin’s Creed has always had a take on history, casting historical celebrities as participants in a centuries-long invisible war between the Templars, the hidden tyrants running the world, and the Assassins, who stand up for the little guys and stick it to the authorities by sticking retractable blades into Templars’ guts. Assassin’s Creed Rogue, though, is clearly more interested in its own history. Rogue feels like an attempted meditation on the past and future of Assassin’s Creed, but it’s difficult to tell whether it’s trying to champion or chastise itself. The greatest indication that Ubisoft might finally be criticizing its tiring series is right in the premise. Rogue stars Shay Patrick Cormac, an Irish Assassin working in the Atlantic Northeast who turns on his hit-men brethren and hitches his wagon with the Templars at the height of the Seven Years’ War. The Assassins have always been the heroes of the series—the clue is in the title—but to Rogue’s credit, it fully commits to Shay’s change of loyalties. From the second he turned Templar, I expected the story would climax with Shay learning that his new teammates are exactly as evil as the Assassins claim them to be, but no such revelation ever materialized. It’s a refreshing change of viewpoint for a series that has become stuck in its ways. That change in perspective isn’t the same thing as a break with the series’ past, though. In fact, Rogue’s plot is positively thick with references to previous Creed installments. Characters from at least four other Assassin’s Creed titles show up with barely any introduction, and events from previous games are mentioned without explanation. There is clearly an expectation that the player is—or should be—intimately familiar with the ins and outs of the series’ Byzantine backstory. The tale of a charismatic do-gooder like Shay turning heel could have been the perfect opportunity to jettison the baggage saddling past Assassin, but instead, Rogue is mired in the series’ past. Unfortunately, Rogue revisits the chaff of the series as well as the wheat. Shay moves as imprecisely as any other series star. I lost track of the number of times he went drunkenly careening off the relatively simple route I intended for him. Shay also, like all trained Assassins, has a deep love of hay and will giddily flop into any pile he comes across no matter how much of a hurry he’s supposed to be in. The series’ fondness for distractions is here in full as well, with side quests that range from amusing diversions to obnoxious busywork. Like its sailing, most of these optional activities are just variations on gimmicks from previous entries—a fort capturing diversion is pilfered from Brotherhood and hunting is recycled from Assassin’s Creed III. Collectibles are at an all-time high too. My favorites are the Animus Fragments, glowing generic objects that, when collected, offer no benefit except to de-clutter your map. They’re the platonic ideal of video game collectibles. Rogue’s only meaningful contributions to the series’ leaning tower of time sinks are rooted in its new anti-Assassin bent. 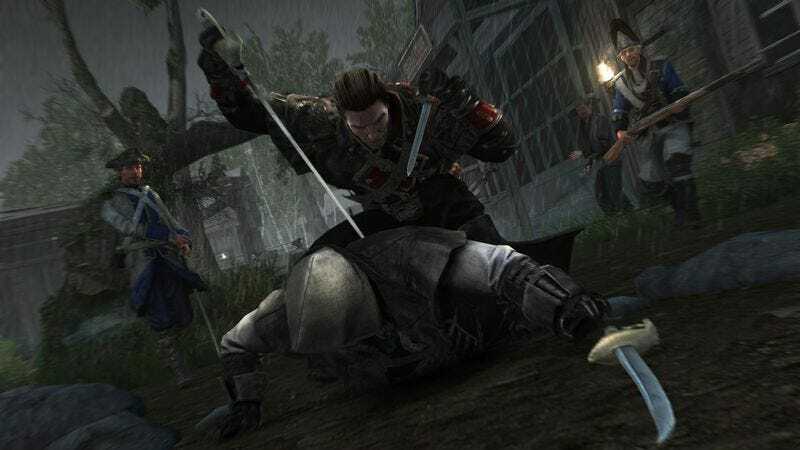 One optional activity requires Shay to intercept Assassins before they can reach their target, but the only reward for completing these is one of about 20 optional costumes that offer no in-game benefits. Shay is also constantly being targeted by Assassins himself, and has to kill them before they can kill him. There’s no reward for disposing of these would-be killers, though, and all they really add to the game is the chance of getting murdered for no reason while you’re minding your own business. Free advice: Steer clear of hay. Rogue may be made from spare parts, but most of those parts still have some life in them, and they’re in service of a comparatively self-aware and self-critical story. Between this and the similarly convention-bucking Black Flag, it’s clear that there’s somebody at Ubisoft who understands what works in the series and what has to go. The emails you can rifle through at Abstergo Entertainment tease a potentially exciting future for the series—Russia, Brazil, China, Japan—but unless it can get over its current identity crisis, the best we can hope for from the future of Assassin’s Creed is more near-hits.